Gordon Strachan should only stay on as Scotland manager if he thinks he can end the long wait for a place at a major tournament, says Willie Miller. Former international defender Miller is worried that a run of nine missed championships is set to continue, with a tough World Cup qualifying draw. "There are only 13 European places available for Russia," explained ex-Aberdeen captain Miller. "Are we really contemplating that if we can't get into 24 teams at Euro 2016?" Having missed out on a place in France next summer, Scotland's focus switches to Russia 2018, with qualification matches beginning next September. The Scots are in Group F, along with England, Slovakia, Slovenia. Lithuania and Malta. Miller's former Dons and Scotland team-mate Strachan is now out of contract and considering his future after finishing behind Germany, Poland and Republic of Ireland in the race for places at the expanded European Championship. "Gordon has got to go away and think long and hard about the chances of taking this squad out of a qualifying section with England, Slovakia and Slovenia," Miller, 60, told BBC Scotland. "Does Gordon believe he can do that with this group of players? "If he doesn't, he'd be better walking away with that nice photograph he has from the end of the game in Portugal." 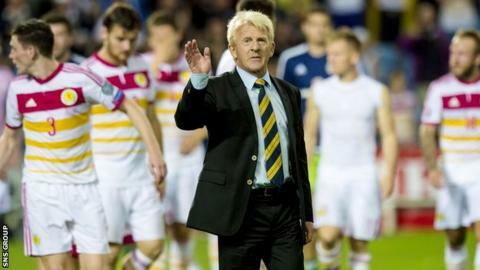 Miller was referring to the scenes at the end of Scotland's 6-0 win over Gibraltar on Sunday that marked the end of a failed campaign, when coaching staff and players saluted the large travelling support. Scotland conceded 12 goals in their 10 Group D matches and Miller, who won 65 caps, thinks that the defence is an area in need of strengthening. "If we have a problem with central defenders, if we've got a problem with full-backs and the space in behind them - and the first half against Poland [last Thursday's 2-2 draw at Hampden] suggests we do - we might have to go back to a five-man defence," he said. "We might have to be more pragmatic. "It's all about qualifying for these major championships. We've been starved of that for too long."